Another single exposure HDR image tone mapped use Photomatix. Guess how I got the shot? From a truck moving 40mph on a gravel road… somehow I manage to pull this one off. Usually they end up really blurry but this one came out pretty sharp, enough to be creative with! I love shooting out the window of a car, one of my favorite part about traveling and photographing new places. It’s amazing how much you can tell about a country and the people that live there just by driving through the roads. This farmer was watching someone plow the land. I believe he’s standing by to burn the dead plants as the tractor passes. There were also water buffaloes near by so maybe he was watching them too. But than again I notice the herders just tie their cattle to branch and leave them there to graze all day. I processed this photo using my Photoshop action and a new technique that I’m working on, expect a new e-book and Photoshop action soon. This technique works very well with people and adds a very artist look to any HDR image. Regular photos don’t look good with this method, they have to be tone mapped using an HDR program. I use Photomatix and find it works very well with my action. 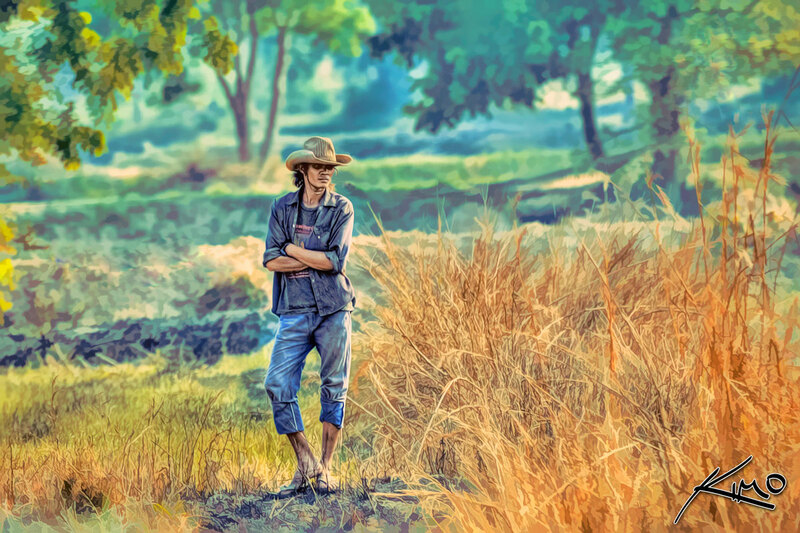 Topaz Simplify – Photoshop plugin used for artistic effect.